The announcement that there was a new Godzilla film being made was easily the biggest (pun somewhat intended) giant monster news in the US since the 1998 Godzilla. Sure, there were plenty of other giant monsters films in that sixteen year gap, even several Godzilla films (including the excellent GMK: Giant Monsters All-Out Attack (2001). Godzilla 2000 (1999) was the only one of these films to receive a wide theatrical release in the States and it premiered in the dead of August. Cloverfield (2008) was popular initially, but eventually slipped from the public consciousness. Pacific Rim (2013) failed to connect with film goers and giant monster fans as well as hoped. Add all of this to the poor reputation of the ’98 Godzilla and the pressure was on for the new Godzilla to impress. The human characters in a giant monster movie are rarely as interesting as their literally bigger-than-life co-stars and Godzilla is no exception. Aside from Bryan Cranston‘s energetic bordering on scenery chewing performance, the rest of the cast performs reasonably if nothing else. There is a continual effort to keep characterization low-key to help push the faux-realism of the presentation. I’m not sure this is a wise move in a film filled with people running from giant bug things, high altitude skydiving, and massive explosions. Sub-textually here is a story about someone losing a father figure and their life going to hell, and only a new (big green) dad can set right a world gone mad. It's a very odd choice and while I can't really say it's to my taste, I do wish the story would have pushed this point just to see where it goes. The monster action of Godzilla is very successful. Godzilla and his opponents feel dangerous. I was also pleasantly surprised to see the story frame Godzilla as a hero figure, a nice change of pace from many of the 1990’s and 2000’s era films where he is often portrayed as an anti-hero if not outright villain. Godzilla is alive with a grumpy personality but isn’t anthropomorphized in the process, a tricky balancing act and one the film does well. The imagery of Godzilla looks wonderful. There is a leaden horror the seeps into the screen as the monsters take their toll on humanity. The monsters themselves feel weighty and visceral. The camera knows when to sit still and at distance so the viewer can take in the scope of what is happening. 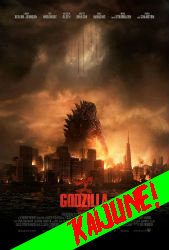 Godzilla is solid but flawed first step in re-establishing the big G as a film star. There is plenty of room to expand and develop this new cinematic universe, and since I’m interested in seeing more of it, I would call Godzilla a success.